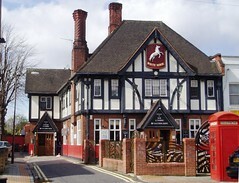 The White Horse is a large pub just off Peckham Rye. The pub is divided into three areas - a bar at the front, with high tables and a pool table; a more traditional pub area in the middle; and a large function room at the back. The pub serves a decent range of ales (e.g. IPA, Deuchars) as well as the usual lagers and some good wines. I have only ever visited on Sunday, as its superb Sunday roast is a bit of a closely-guarded secret in Peckham. The roast lunch is extremely popular (especially with Peckham's pensioners!) so get there early - the pub opens at noon on Sunday. For £6.50 you get a large plate of roast beef, Yorkshire pudding, cauliflower and broccoli cheese, roast potatoes and 2 veg. There are also other roast meats available (on the day I visited in February 2008, there was roast pork, chicken and rack of lamb available, as well as cod goujons and lasagne). The food is served school dinner style from a hotplate on the bar. Two words of warning - the pub doesn't take cards, and there isn't a vegetarian option available. Last visited by Laura, 24 February 2008. Last edited 2011-06-26 14:43:29 (version 5; diff). List all versions. Page last edited 2011-06-26 14:43:29 (version 5).